It is a story about underground water: when the nectar turns into poison. When a daily task of drinking water from the handpump becomes the source of crippling disease and death. This is not a "natural" disaster -- where natural arsenic or fluoride, present deep down, just happened to make their way into drinking water. It is about a deliberate poisoning. Created by successive governments and multilateral agencies: all well intentioned in their quest for safer, cleaner water supply; all investing in boring into the ground, till they brought the dark zone into the light of daily life. Whatever the uncertainties in the exact causes of these diseases, the link with groundwater is undisputable. Studies done in the arsenic-affected belt show that concentration increases with depth in the aquifer -- peaks around 100-125 feet down -- and gets reduced as it reaches 400 feet down. The fluoride-groundwater link is clear but its geographical extent is not known. No one region can be identified as chronically or endemically fluoride-prone. A recent report of the Geological Survey of India lists regions that are on the fluoride-red alert stretching from Punjab in the north to Tamil Nadu in the south. The story begins many years ago, sometimes in the 1960s and 1970s, when national governments and international agencies drew up detailed plans to provide safe water to all. They understood, rightly, that bacteria in water kills more babies than any other substance in the world. They believed the water on the surface -- in millions of ponds and tanks and other water harvesting structures -- was contaminated and so invested quickly in new technologies to dig deeper and deeper into the ground. Drills, borepipes, tubewells and handpumps quickly became the triumphalistic instruments of public health missions. Then the water table started to fall. Investment were made to dig deeper. And here is where the story turns. While government was well-intentioned in its quest for clean water, it was equally callous, indeed criminal, when it came to responding to the news that was filtering in that maybe, just maybe, the 'strange' diseases are linked to the water that people are drinking. It responded with denial. It responded with misinformation, confusion and ineptitude. Science and its uncertainty became the servile tool for inaction. This subplot is marked by sheer and gross incompetence in efforts to identify the problem, its cause and to find alternatives. This subplot leads to deadly and terrible disease. The story is therefore, most of all about victims -- living in scattered villages across this region. These are "official" victims, whose tubewells are marked in shades of red, to identify its levels of contamination. But then there are the "unofficial" and unidentified victims. Maybe thousands. Maybe millions. Nobody knows because nobody has cared to find out. Even these "victims" do not know. They only know that they are ill. But is the cause of their mysterious illness their water? Where do they go to find out? This story is also a story about unrecognised warriors, who have struggled and fought to make the world recognise the problem in the first place. To name only a few: in West Bengal, Dipankar Chakraborti; in Bangladesh, Quazi Quamruzzaman for making us listen to the suffering of arsenic affected people; and A K Susheela in New Delhi for persisting with information about fluorosis. Even now, the mindset is to find a technical-fix for poor people. Who will make the technologies that work? Who will work these technologies? Even now, public policy refuses to accept that the problem is not arsenic or fluorosis per se. The problem is groundwater usage. The answer to the problem, therefore, is not the management of the disease. The answer is in the management of water. We are threateningly dependent on aquifers for our drinking needs. There is no regulation worth its name to manage this resource. Every attempt to legislate against overuse remains in a draft form. At the same time, technological advancement is helping us reach lower and lower into the earth to search for water. What we desperately need is strategies to ensure that the extraction of water does not exceed the recharge of the aquifers. We need to effect programmes to invest in harvesting the rainwater to rebuild the groundwater reserves. But this is not the only solution. We will also have to invest in surface water systems -- to help recharge groundwater and augment available water sources. And here is where public health proponents must work with water management communities. Governments cannot assure water supply. We know this. The problem of arsenicosis and fluorosis has emerged because public policy discounted the community water systems and believed in a technical fix. The task is now to rebuild the community water systems -- the ponds, tanks, stepwells -- and to keep them clean and unpolluted. This task can only be done through the willing and active involvement of local people. Otherwise, water will remain a pipedream. Pilfered, or shattered and broken. Remember, the price of inaction will be the crippling of this country. Deliberate crippling. Our earth will become the dark zone. Human negotiation with its own capacities and actions often tends to be triumphalist. A man admires his muscled torso; an elite believes itself to be the omphalos -- navel, centre of gravity -- of the world; a State goes to war. At such times, it is best to remember that human ambitions cannot be inflated into or conflated with insistent demand. It must be remembered that humans do not only insist upon gratification in the here, now and thereafter. No, a self or a society can also turn to or turn upon the requirement of a basic need, such as quenching its thirst and not falling ill. Yes, a self or a society can also stand on the threshold of grasping after clean drinking water only to find itself facing an abyss: arsenic. Arsenic is a metalloid element, brittle in nature and gray or tin white in colour. It is not found in nature as a free element, but exists in combination with other elements; it exists as a compound of oxygen, chloride, hydrogen, lead, mercury, gold and iron. There are as many as 150 arsenic-bearing minerals that exist in nature. However, only three of them are considered as arsenic ore (the amount of arsenic in each is very high): Realgar, or arsenic di-sulphide; Orpiment or arsenic tri-sulphide; and Arsenopyrite or ferrous arsenic sulphide. Arsenopyrite has been primarily identified as the main source of arsenic pollution in Bangladesh. Chemically, arsenic compounds are of two types: organic and inorganic. Inorganic arsenic is found in two forms: trivalent arsenite and pentavalent arsenate. Inorganic arsenic is more toxic than organic ones. The trivalent form is 60 times more toxic than the pentavalent form, and is more soluble in water. Pentavalent arsenate and trivalent arsenite are commonly found in the groundwater of both West Bengal in India and Bangladesh. In 1983 K C Saha, former professor of dermatology at the School of Tropical Medicine, Kolkata, began to receive patients with skin lesions that resembled the symptoms of leprosy. He found out they were not. Since all the patients were from the district of 24-Parganas, Saha along with others began to look into the cause. The cause was found to be arsenic toxicity. So it happened that groundwater arsenic contamination in West Bengal was first reported in a local daily newspaper in December 1983, when 63 people from three villages located in different districts were identified by health officials as suffering from arsenic poisoning. Ten years later Dipankar Chakraborti, an environmental scientist researching on the extent of arsenic poisoning, came across a woman in a village who had skin lesions. The puzzling thing was, she was the only one in the family who showed the symptoms of arsenic poisoning. Upon enquiry, she told him she was recently married into the family. She was from Satkhira in Bangladesh, and 'back home' there were others who had the same kind of lesions. Chakraborti realised that the scale of the problem was far larger than understood so far. He began investigations. Teaming up with Quazi Quamruzzaman, chairperson of the Dhaka Community Hospital, Bangladesh he did a field survey and found, in 1995, three villages in two districts of Bangladesh whose groundwater contained arsenic above 0.05 milligram per litre (mg/l). In the same year the World Bank, after two years of "investigation", confirmed there were high levels of arsenic in numerous shallow and deep tubewells in various areas of Bangladesh. There are two ways to answer this question: while institutions such as the uk-based British Geological Survey (bgs), which studied the problem and came out with its report in 1999, suggest that the cause is a natural one, other researchers contend that the cause is human-made. According to the first hypothesis, the arsenic probably originates in the Himalayan headwaters of the Ganga and Brahmaputra rivers, and has lain undisturbed beneath the surface of the region's deltas for thousands of years in thick layers of fine alluvial mud smeared across the area by the rivers. Most of Bangladesh and the arsenic-affected areas of West Bengal lie in the alluvial plains formed in the quarternary period (last 1.6 million years). The Garo-Rajmahal Gap broad alluvial plains of the Ganga and Brahmaputra rivers -- called the Himalayan Foredeep -- extend to the northwest and northeast, respectively. To the north of this line, lie the crystalline rocks and meta-sediments of the great Himalayan thrust blocks. West Bengal (Purulia district), Bihar and the Shillong Plateau (north of Sylhet and Mymensingh districts of Bangladesh) are extensive areas of Precambrian era (last 570 million years) having metamorphic rocks and granites with widespread sulphide mineralisation. 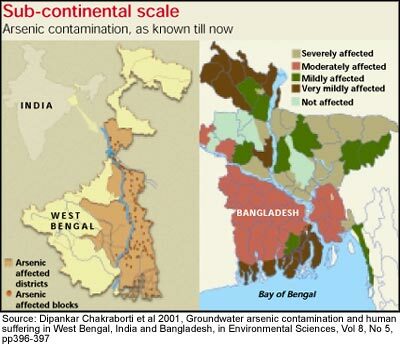 Because of their position close to where the river Ganga enters Bangladesh (geologically speaking), bgs suggested that they may be the primary source of arsenic in the Bengal alluvium. It isn't as if the arsenic concentration in the mud is extraordinary. The real culprit is time, according to David Kinniburgh, project leader with bgs. The mud in Bangladesh lies thicker, wider and flatter than almost anywhere else on Earth. It can take hundreds, even thousands of years for underground water to percolate through the mud before reaching the sea. All the while it absorbs arsenic. This, says Kinniburgh, helps explain the diverse pattern of arsenic concentration in tubewell waters. Almost all contaminated wells tap water from a depth of 20 metres (m) to 100 m. Shallower wells are clean because they contain mostly rainwater or water flowing swiftly through the sediments. Deeper wells tap water in older sediments which have by now been flushed clean of arsenic. Ironically -- and this is where geology shades into politics -- water below 20 m to 100 m has been the overexploited 'target' of drinking water schemes of both government and international humanitarian organisations. Experts like Kinniburgh relate the presence of excess arsenic in groundwater to the geological formation of Bangladesh. Some, however, differ: they suggest that the origin of arsenic-rich groundwater is human-made. It is related to the rate of groundwater extraction. Their hypothesis, called the pyrite oxidation thesis, describes how arsenic gets mobilised in the groundwater. In the pyrite oxidation hypothesis, arsenic is assumed to be present in certain minerals (pyrites, iron containing rocks) that are deposited within the aquifer sediments. Due to the lowering of the water table below deposits, arseno-pyrite -- oxidised in a zone of the aquifer called the Vadose zone -- releases arsenic as arsenic adsorbed on iron hydroxide. During the subsequent recharge period, iron hydroxide releases arsenic into groundwater (see diagram: Making poison). Two arguments are given in support of this thesis. The first is the intensive irrigation development in Bangladesh, which bears a striking resemblance to West Bengal. Using deep tubewells (dtws) and shallow tubewells (stws), irrigation development started in the 1960s and rapidly expanded in the 1980s. At first, dtw was popular because the government of Bangladesh subsidised its purchase. But when it stopped giving dtw loans in 1991, people turned to stws. The government's new privatisation initiative, and the rules of stw regulation, further ensured stw paramountcy. This method of extraction -- precisely in the 20m to 100 m below ground level -- ensured that the contribution of groundwater to total irrigated area increased from 41 per cent in 1982-1983 to 71 per cent in 1996-1997. (In the same period, reliance on surface water declined from 59 per cent to 29 per cent; reliance on traditional water harvesting systems fell to a low of 11 per cent.) Interestingly enough, this period was also the time when millions of tubewells were sunk into the ground to provide drinking water. The other argument that supports the pyrite oxidation thesis is that, prior to irrigation development -- and drinking water supply schemes -- based on groundwater, there are no reported cases of arsenic patients in Bangladesh. "Nine districts (out of 18) in West Bengal, India, and 42 districts (out of 64) in Bangladesh have arsenic levels in groundwater above the World Health Organization [who] maximum permissible limit [guideline value for arsenic in drinking water] of 0.05 milligram per litre (mg/l)." "We have identified 985 arsenic-affected villages in 69 police stations/blocks in West Bengal. In Bangladesh, we have identified 492 arsenic-affected villages in 141 police stations/blocks." "To date, we have collected 10,991 water samples from 42 arsenic-affected districts in Bangladesh for analysis, 58,166 water samples from nine arsenic-affected districts in West Bengal. Of the water samples we analysed, 59 per cent and 34 per cent, respectively, contained arsenic levels above 0.05 mg/l. Thousands of hair, nail, and urine samples from people living in arsenic-affected villages have been analysed to date; in Bangladesh and West Bengal, 93 per cent and 77 per cent samples contained arsenic. We surveyed 27 districts in Bangladesh for arsenic patients; we identified patients with arsenical skin lesions in 25. In West Bengal, we identified patients with skin lesions in 7 of 9 districts. We examined people at random for arsenical dermatologic features (11,180 and 29,035 from Bangladesh and West Bengal respectively); 24.7 per cent and 15.02 per cent of those respectively examined had skin lesions." "After 10 years of study in West Bengal and 5 in Bangladesh, we feel that we have seen only the tip of the iceberg". Insiduously, into the human body. Arsenicosis, or arsenic toxicity, develops after two to five years of exposure to arsenic contaminated drinking water, depending on the amount of water consumption and arsenic concentration in water. Initially, the skin begins to darken (called diffuse melanosis). This happens first in the palms. Diffuse melanosis leads to spotted melanosis, when darkened spots begin to appear on the chest, back and limbs, although the latter is what is usual among people, and so is taken to be an early symptom. At a later stage, leucomelanosis sets in: the body begins to show black and white spots. It is common in persons who have stopped drinking contaminated water but previously had spotted melanosis. Three types of skin cancers are observed: Bowen's disease (form of squamous cell carcinoma); basal cell carcinoma and squamous cell carcinoma. These cancers develop primarily from keratosis. In Bangladesh and West Bengal, the majority of the affected population are in the initial and middle stages. "The present situation is that in 2000 villages in 50 out of a total 64 districts in Bangladesh, groundwater contains arsenic above 0.05 mg/l and more than 25 million people are drinking (poisoned) water." In West Bengal, "2700 villages have so far been identified and more than 6 million people from 9 affected districts are drinking water containing more than 0.05 mg/l arsenic. 300,000 people may have visible skin lesions. Samples indicate that many more may be sub-clinically affected. Children in arsenic-affected villages may be in special danger." "Although the West Bengal arsenic problem became public almost 20 years ago, there are still few concrete plans, much less achievements, to solve the problem"
"Villagers are probably in worse condition than 20 years ago. Even now, many who are drinking arsenic-contaminated water are not even aware of that fact and its consequences"
"20 years ago when the West Bengal government was first informed, it was a casual matter, without the realisation of the magnitude this problem was to assume. At least up to 1994, one committee after another was formed but no solution was forthcoming. None of the experts has suggested solutions that involve awareness campaigns, education of villagers and participation of the people." In the early 1970s, most people living in the countryside relied on surface water -- ponds, or rivers -- to meet their drinking water needs. As a result diseases due to bacteria-contaminated water, such as diarrhoea, dysentery and cholera were extremely widespread. To tackle this problem, and the related problem of drinking water, the government switched to a policy of tapping groundwater. The government began providing villages with tubewells and handpumps, with aid from such organisations as the United Nations Children's Fund (unicef) and the World Bank: unicef initiated the programme and paid for the first 900,000 tubewells along with its co-sponsor. Even as millions of dollars were pumped into the country as aid for 'clean' drinking water, and between 8-12 million tubewells installed, the stage got set for what the who has called the biggest outbreak of mass poisoning in history. And now, as the scale of the calamity keeps becoming bigger, the government and international experts seem completely incapable of solving the problem. Even worse, both the authorities and the agencies refuse to admit their culpability. This dimension of the arsenic contamination problem simply beggars belief. As uk-based science journalist Fred Pearce puts it in his article Bangladesh's arsenic poisoning: who's to blame? : "Who knew what and when?" When the tubewell programme began, nobody thought of testing for arsenic. unicef explained that "at the time, standard procedures for testing the safety of groundwater did not include tests for arsenic [which] had never been been found in the kind of geological formations that exist in Bangladesh." But many geochemists, such as John Macarthur at London-based University College, scoff at such a suggestion. One could equally scoff at the Bangladesh government claim that arsenic cases came to its attention only in 1993 and it concluded two years later that the poisoning was widespread, with tubewell water the likely cause. For, Quamruzzaman, the government was told as early as 1985 that Bangladeshis crossing the border into West Bengal were being diagnosed with arsenic poisoning. The World Bank maintained that before 1993, groundwater was never tested for arsenic. But a Dhaka-based engineer who worked for a British engineering consultancy firm had published, in 1990, his findings about arsenic in groundwater. Source: CPCB 2002, Arsenic contamination in groundwater and its control, Central Pollution Control Board, Delhi, p 19. It wasn't until 1998 that the international community finally accepted some responsibility for solving the problem. The Bank announced an emergency three-year programme to identify poisoned tubewells. The Bank would initially survey 4,000 villages (out of 68,000 potentially at risk) and draw up action plans. This 'fast-track project' would be the first phase in a 15-year programme to screen the country's tubewells. But agencies and the government spent another year in negotiating the details, and the project's completion date was pushed to late 2002. A leading analyst of the arsenic crisis pronounced the project dead, but the Bank denied this allegation. When the project did take off, it succeeded in covering just 800 villages.If international action was tardy, the government wasn't far behind. In 2000, it set up a steering committee to "detect the causes of arsenic contamination across the country", an issue that earlier research had already resolved! This attitude is still to change. Till 2002, there was no strategic plan to address the public health issues related to arsenic. Most people are still unaware of the hazard and the ways to deal with it. And, in May 2003, the Bank will unveil the Arsenic Public Health Project to "strengthen national capacity to address public health aspects of arsenic in the long term". Renu Ali, of village Aripara, North 24-Parganas is blind. This wasn't the case a few years back. Then arsenicosis destroyed her eyesight, and life, completely. Two of her sons have left the village in search of safe water and living. Another son and daughter-in-law live with her, perhaps because they suffer from arsenicosis too. She has lost hope, just like Sahajad Ali, who lives with his three brothers in Chakargatchi village in the same district, and all of them have arsenicosis. They are very cynical about any kind of arsenic mitigation technology. They don't think, for instance, that dugwells (alternative source of safe drinking water) will work in their village. Some have lost hope. Others merely wait for the doctor, like 40-year-old Sumatya in village Gardmari in the Aomkal block of Murshidabad district. She stays alone. There are wounds on her thighs. The wounds bleed, and villagers are kind enough to pour hot water on them as a kind of swab. The doctor is expected. It is evening. The doctor in the village has not directed her to any hospital in the city; her problem worsens each passing day. Sumatya waits. Like her, Leaten Vaivah of village Rezlapara, Nanda block in Murshidabad, is a widow living all alone. She has a cancerous wound in her hand that is slowly spreading to the rest of her body. She has not seen any doctor except the local quack in the village. Since she lives alone there is no one to take care of her. She herself doesn't have the interest or the zeal to travel all the way to Seth Sukhlal Karnani Memorial Hospital in Kolkata, where an arsenic clinic runs every Thursday. "It is too far and costs money to be going that far, I am not interested", she says. She seems still as death. But there are those who also fight the disease. Adaitopal, of Holsur village in the Deganga block of North 24-Parganas, was affected by arsenicosis 10-12 years back. He tries to lead a normal life, despite the fact that his right foot was amputated nine years ago. He has not lost hope yet. He gives hope to other villagers by digging wells in the village. At present he is busy making a dug well in his own compound, which will also serve families that live close. Nazrul Huq, of village Holsur in the Deganga block of North 24-Parganas, is like a messenger of God in his village. After the onset of gangrene in his finger, he visited the doctor at the All India Institute of Hygiene and Public Health, Kolkata. After confirmation and fearing cancer, his finger was amputated in 1998. Now he spends his time informing people about arsenicosis. That's something Rakia cannot do. Her husband has left her. She must be around 35. She is considered "mad" by the villagers because arsenicosis has made her a loner. She is not the only one in Fakir para (locality), Chanalti block, North 24- Parganas who suffers from arsenicosis or has been abandoned by loved ones. But at least there are people in the para. Fakir para is not like Chandalati village in the Deganga block of North 24-Parganas, completely deserted. Only 5-6 people live there. One of them is Abdul Tarafat, 60, who travels about 10 km once in two days to get water from adjoining villages. Of course he has arsenicosis. He doesn't want to leave. Here, everybody is affected by fluorosis (called wah in Gujarat, genu valgum in Madhya Pradesh, bankapatti in Rajasthan and lunj punj in Uttar Pradesh). Here, it is said, people after childhood jump straight into old age. In Jharana Khurd village 20 km from the city of Jaipur in Rajasthan, there are no youth. All 1,200 people irrespective of age look old and have cracked teeth. "Our shoulders, hips and ankles are swollen and ache all the time. If we squat on the floor, it's painful to stand up," says Sayar Singh, a 30-year-old villager. "All 25 tubewells have dried up in the last three years of drought and now we only have one tubewell. The doctor has told us that its water is poison. But we have no choice," says Bhanwar Lal, a 40-year-old villager. In Liliya block of Amreli district in Gujarat, people hang ropes from the ceiling of rooms and toilets. They have to clutch on to these in order to walk about. "Almost 70 per cent of the people in our village are suffering from wah. In the morning, our knees are swelled and we have to wait minimum for one hour before we can get up and move," says Deewani Pheekabhai, sarpanch, Haripur village in this block. Such affliction brings all life to a standstill. Its everyday routines become bizarre experiences. Babalbhai Patel, of village Balisana in Gujarat's Patan district, put this question to the Down To Earth correspondent, "Can you provide me with a better toilet as I cannot sit and defecate?" A few years back, he said, he could walk 40 miles a day. Such affliction sunders livelihoods. "In Bakhari village in Jharkhand's Daltonganj district, almost two-third population has developed physical deformities, as its water sources have high fluoride level (1.65 mg/l - 5 mg/l)" informs Ranchi-based geologist Nitish Priyadarshi. "This is affecting their main occupation, agriculture. There are fewer hands to till the soil." Says Kishore Parmar of Gondaran village in Amreli district of Gujarat: "Fluoride rich water is bad for land and crops." A decade ago, he says, one hectare (ha) of land would produce 100 kg of cotton. Today, it produces only 40 kg. Even the wheat grown with fluoride-laced water tastes bad, complains a fellow villager. "No one even buys cattle from such (fluoride-affected) villages," says Raman Patel of the Aga Khan Rural Support Programme, Ahmedabad. Such affliction brings with it social stigma. Points out V K Joshi, former director, Geological Survey of India, "Siriha Khera village of Unnao district in Uttar Pradesh is facing a social boycott. No one marries a girl from that village." Nanak Santdasani, assistant engineer with Gujarat Water Supply and Sewerage Board (gwssb) sums up the condition of Wah india's 65 million people: "Fluorosis is a disease that neither allows a person to live nor to die." It is clear that fluorosis is not a localised problem. It is spread across states, and across a variety of ecological regions -- the Thar desert, the Gangetic plains, the Deccan plateau. Each of these regions are distinct in terms of rainfall, soil type, groundwater recharge regime, climatic conditions and hydro-geology. How, then, is such omnipresence to be accounted for? Partly, the answer lies in a pan-Indian natural phenomenon: high fluoride concentration in groundwater. High fluoride concentration in groundwater is a natural phenomenon in close to 23 countries such as China, Sri Lanka, West Indies, Spain, Holland, Italy and Mexico. Experts claim that a fluoride belt stretches across the north and east of Africa, passing through the Middle East across Pakistan and India, and thence into Southeast Asia and the south of China. According to a Rajiv Gandhi National Drinking Water Mission (rgndwm) report, the bedrock of the Indian peninsula consists of a number of fluoride-bearing minerals: fluorite, topaz, apatite; and rockphosphate, phosphatic nodules and phosphorite (all with high fluoride concentrations). When the bedrock weathers -- a natural chemical process in which the rock slowly crumbles to form soils -- the fluoride leaches into the water and the soil. Leaching depends on various factors: the chemical composition of water; the presence and accessibility of fluoride minerals to water; and the time of contact between the source mineral and water. For instance, deep alluvial aquifers contain great quantities of water that accumulate over geological time, and so could contain water with high fluoride concentration at the very bottom. Hard rock aquifers contain water in cracks, but the very proximity to rock might make this water fluoride-rich, especially if it is extracted faster than recharged. Climatic conditions also play a major role in deciding the extent of fluoride in groundwater. For instance a 2002 paper -- Fluoride in shallow aquifers in Rajgarh tehsil of Churu district, Rajathsan - an arid environment -- published in Current Science points out that "the arid climate with high evaporation and insignificant natural recharge might have accelerated the strengthening of fluoride concentration in the groundwater of this (Churu district) area". The presence of high concentrations of fluoride in groundwater begs a further question: the Indian penisular bedrock has always been the same; then how is it that this problem has surfaced only in the last three decades or so? "The presence of fluoride in groundwater and soil is also human-made. We have over-extracted groundwater and have tapped aquifers with high fluoride concentration," says S K Gupta, senior scientist with the Ahmedabad-based Physical Research Laboratory. Points out Kaushikbhai of Utthan, an Ahmedabad-based non-governmental organisation (ngo): "Over-exploitation of groundwater in the last 20 years is the chief reason for the spread of fluorosis in Gujarat. With the coming of diesel pumpsets, things have changed. Farmers have started to dig deeper into the earth's crust and are literally extracting poison." "Thirty years back we used to drink water from open wells and talab, and there was no problem of fluoride. But in the last two decades, we have gone deeper and deeper into the ground and are extracting water with the help of pumpsets," says Devaji Thakur of Thakrasan village in Patan district of Gujarat. He says his state is a classic case of falling water tables and increasing incidence of fluoride in water. 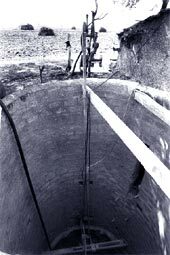 Pre-1935, the groundwater was available at the depth of 5-10 metre (m) and could be manually lifted. Post-1955, groundwater levels started to decline rapidly, between one and three metres per year. At present in some districts such as Mehsana, the water table is as low as 365 m below ground level. "Over-extraction of groundwater cannot lead to introduction of fluoride in groundwater, but leads to tapping of high fluoride aquifer," says Gupta. Gupta's statement takes on a horrific hue once it is realised that 85 per cent of rural water supply in India comes from below the ground, and that cities, too, are digging deeper into the earth's crust to slake their thirst. What further complicates this picture is a peculiar interplay of official apathy and people's needs. As Rajeev Katpaliya, an Ahmedabad-based planner puts it, "It is a question of survival for people. They need water and if government does not supply it, they will go deeper." "People are extracting water from the depth of 300 m. What can the state do?" questions V C Trivedi, collector of Amreli district in Gujarat. But what has the state done? The 1970s and 1980s were a time of massive state investment in rural water development. Not only had more land to be brought under irrigation, but also drinking water supplied. These decades saw an exponential rise in the number of privately-owned pumpsets and wells, even as investment in public wells remained flat. Encouraged by state subsidies on diesel and electricity, people put their money on diesel pumps and then submersible pumps (as water levels went down). The land was literally pockmarked with borewells; the race to reach the bottom of the aquifer had begun. The government launched the Accelerated Rural Water Supply Programme in 1971-72. The aim was to assist states and union territories to increase the pace of coverage of drinking water supply in the country. The entire programme was given a mission approach in 1986, with the launch of the Technology Mission of Drinking Water and Related Water Management, also known as the National Drinking Water Mission (ndwm). 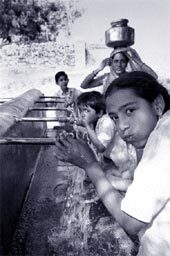 ndwm was renamed as the Rajiv Gandhi National Drinking Water Mission (rgndwm) in 1991, which is at present managed by the Union ministry of rural development. The pace did increase. In the 1980s, called the decade of drinking water, international agencies such as the United Nations Children's Fund (unicef) lent their hand. The ubiquituous Mark II handpump became a symbol of rural relief. In all this, nary a thought was given to the source of national gratification: groundwater. Even less was given to the groundwater quality that handpumps were regurgitating. A unicef paper, Mitigating fluorosis through safe drinking water, points out that "due to the inadequacy of water-quality monitoring infrastructure and the supply-driven nature of the government programme involving some three million deep-well handpumps during 1977-1997, water quality testing did not receive the desired attention". Then came the 1990s. Even as scientists and the research community -- belatedly; the damage was done -- began to suggest that the "water development" mindset had to be replaced by a "water management" paradigm, the government found itself in the quagmire of fluorosis. disavowal: "Up till 1998, we at the Centre used to directly fund programmes on fluorosis control in states, but after 1998 the power was delegated to states. Funds are provided to states, which then plan on their own. We have told the states to use 20 per cent of the total budget money for water quality related issues, but it is not mandatory and not many states are hence spending money on water quality," informs Kumar Alok, deputy secretary, rgndwm. Writes A K Susheela (in her paper Sound Planning and Implementation of fluoride and fluorosis mitigation programme in an endemic village): "The investment and efforts made through water supply agencies/public health engineering departments in the endemic states have to a great extent not yielded successful results." dismay: "We have not studied the problem of fluorosis with prevention as the objective. And we have not invested enough finances into this. We are only reacting to fluorosis and not making use of our predictive capabilities," says Gupta. A senior rgndwm official says the states do not have the technology to ascertain the extent of fluoride pollution. off-the-field bravado: "Using Narmada and its sister rivers, we will provide safe (piped) drinking water to all the villages in Saurashtra by 2005 and then cover the whole state by 2007," claims K K Jadeja, director of Gujarat Jalsewa Training Institute (gjti), Gandhinagar, Gujarat. But a visit to the areas covered under this scheme of the state shatters such piped dreams. Villagers have punctured the pipelines and the subsidised water merely spills about. "We understand that people have broken the pipelines and are stealing water, but what can we do. We cannot have policemen all along the pipeline," says a gwssb official. True, but also, how sustainable are these programmes? "Villages in Amreli are being supplied water under the Kalubhar dam scheme through a 65 km long pipeline. The cost of water supply to the government is Rs 3 per litre. But people are expected to pay only Rs 14 per head per annum, which they are not ready to pay," says Vandana Pandaya, former project associate with Ahmedabad-based Centre for Environment Education. The state government realises the huge costs involved. "Supplying piped water is expensive, especially when it has to be highly subsidised. Gujarat government approached the World Bank to fund the scheme in the state. But the Bank refused on the grounds that there was no sustainability of such a scheme," informs a gwssb official. The state government is hopeful of the scheme. "Soon we will fix water tariff in the state. Industries will be expected to pay a higher price and the money hence generated would be used to subsidise water supply to villages," claims Jadeja. "Any government scheme will not succeed if local people are not involved as there will be no one to maintain the system. If people are made to pay even 10 per cent of the total project cost, they will own up the system," says Gurdhanbhai of Balisana village in Patan district of Gujarat. People also understand that they cannot depend on government for regular water supply. "Piped water is not supplied regularly. Rich villagers have constructed underground tanks for storage of water, whereas the poor continue to drink poison extracted deep from the ground," says Sakeenabehan of Methan village in Gujarat. In village Gondaran, water is supplied once in three days with no fixed timings and gets distributed on first come first serve basis. Even worse, neighbouring Haripur village had not been supplied water for the last 10 days when the Down To Earth reporter visited the village. motivated intentions: In Gujarat, the state government is working on a war footing to provide piped drinking water to villages, sourced from small dams. The Dharoi (dam) water supply is already supplying water to 550 villages and eight towns in Mehsana and Patan district. Kalubhar (dam) supplies water to 42 villages in Lathi-Liliya talukas in Amreli district. But, "There is clear cut politics in supplying water to villages. It is a common feature that backward villages are not covered under the scheme and water is first supplied in villages which have political patronage," says 80-year-old Khodidas Dhakkar of Liliya. Kishore Parmar of Gondaran complains that in his village, backward classes have only one stand post for water supply, whereas the rest of the village has three such standposts. non-seriousness: There is no standard protocol to test fluoride in water (see box: Wah standards). States follow their own procedures. Testing equipments vary from laboratory to laboratory. Not all water sources are tested for fluoride. "There are 40 lakh handpumps in India. How feasible is it to test water of all these handpumps on periodic basis?" asks Alok. 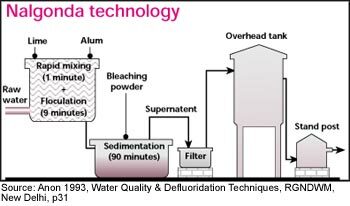 technological failure: The Indian government has failed to provide -- and failed to administer -- appropriate technology, either to detect fluoride, or to clean fluoride-ridden water. plain myopia: In Rajasthan the spread of fluorosis has been linked with the state government's guineaworm eradication programme, which started in 1986. Says S L Choubisa, a fluorosis expert based in Dungarpur, "Under the guineaworm eradication programme, large number of handpumps were dug in endemic villages to provide 'safe' drinking water to people. Simultaneously traditional drinking water sources such as step-wells were closed down. While the guineaworm eradication programme was successful, a negative impact was the spread of fluorosis." The official attitude towards fluoride-laced groundwater is best seen in the manner the state has gone about solutions. In a 1999 nationwide study New Delhi-based Fluorosis Research and Rural Development Foundation (frrdf) found that "only a few laboratories in the country have specified the methodology for fluoride analysis." Experts claim the ion selective electrode method is the most sensitive. But all over India, only 117 laboratories possess this facility. "Water quality testing has not got much importance. Right now the thrust is on water supply coverage. Money has been provided to set up laboratories with the best testing facilities, but some states have not taken an action," says Alok. frrdf's 1999 report also points out that most states follow different methods. There are no specified equipments which are to be used while testing fluoride. People do not mind such erratic supply. They are pleased to depend upon government. State governments are mostly concentrating on providing piped water supply to the affected villages. But how far such schemes will continue to deliver remains to be seen. Fluoride mainly enters the human body through drinking water; 96-99 per cent of it combines with bones, as fluoride has affinity for calcium phosphate in the bones. Excess intake of fluoride can lead to dental fluorosis, skeletal fluorosis, or non-skeletal fluorosis. Dental fluorosis is characterised by discoloured, blackened, mottled or chalky-white teeth. Skeletal fluorosis leads to severe and permanent bone and joint deformations. Non-skeletal fluorosis leads to gastro-intestinal problems and neurological disorders. Fluoride can damage a foetus, and adversely affect the iq of children. Fluorosis can be detected in the neck, spine, knee, pelvis, shoulder and small joint of hands and feet. Gastro-intestinal symptoms include abdominal pain, diarrhoea, constipation, . Some neurological manifestations are nervousness, excessive thirst and tendency to urinate frequently. In spite of all these symptoms, it is common for fluorosis to remain un-diagnosed for a long time. Also, patients often get misdiagnosed with arthritis, spondylitis, or non-specific backache. According to a 2001 study, "the occurrence of fluorosis can vary widely among different locations having almost the same fluoride concentrations in drinking water and can be affected by factors such as climate, individual susceptibility and biological response". The study also concluded that "poor nutrition also plays an important role in aggravating endemic fluorosis", thus explaining why poor people are often the worst affected. Fluorosis is an irreversible disease and there is no cure.